GHRP6 CJC1295 Ipamorelin Magnus Pharmaceuticals. By combining the 3 peptides GHRP 6 and Ipamorelin and CJC-1295, this peptide combination provides a massive stack. Especially in women, the GHRP-6 is very popular due to the skin tightening, anti-aging effect, a more beautiful skin (against aging and against wrinkles). GHRP 6 is one of the most popular peptides for muscle growth, bodybuilding and fat reduction. Ipamorelin is a much more recent growth hormone-releasing peptide (GHRP), which has the advantage over GHRP-2 of no increased excretion of cortisol and prolactin. Furthermore, there are no increased hunger emotions. A natural, sustained and maximal enhancing effect of the body’s secretion of growth hormones (over a longer period of time) is thus given. The advantages of the GHRP 6 portion are known for the great advantage of the skin tightening, anti-aging effect and a more beautiful skin image. This triple peptides stack has been developed to achieve maximum muscle growth while at the same time massively reducing fat and maximizing the anti-aging effect. GHRP6 CJC1295 Ipamorelin Magnus Pharmaceuticals is an injectable combination peptide consisting of three single peptides. Include in the category of Growth Hormone Releasing Peptide (HGH Peptide). A growth hormone releasing peptides, GHRPs for short. 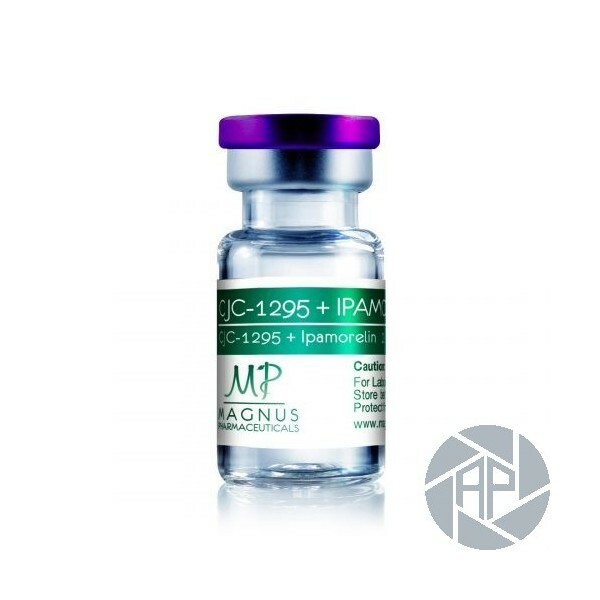 Objective of the GHRP6 CJC1295 Ipamorelin Magnus Pharmaceuticals is a massive increase in the body’s growth hormone production and increased IGF1 formation. This results in accelerated fat burning. All this with no or minimal possible side effects. Other single peptides of this category are GHRP 2 and hexarelin. As for the increase in growth hormone production, all these peptides act in a similar manner. Combination peptides act like multipliers. This GHRP6 CJC1295 Ipamorelin Magnus Pharmaceuticals peptide combination (GHRP 6 + CJC 1296 + Ipamorelin) achieves a synergetic effect and enormously increases the growth hormone level. Based on statements from athletes, it is exactly this combination which allows the sustained growth of muscle mass. An average increase in muscle mass of 9.6 kg in the period of 6 to 8 weeks is reported. 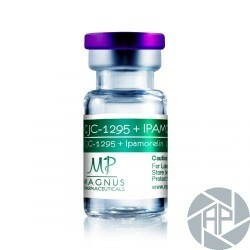 GHRP6 CJC1295 Ipamorelin Magnus Pharmaceuticals Peptide Stack for a stronger and increased growth hormone release and simultaneous maximum production of IGF-1. GHRP6 CJC1295 Ipamorelin Magnus Pharmaceuticals is used primarily in sports, bodybuilding and anti-aging. Here the anabolic properties are used in relation to muscle building. Furthermore, the body fat content is reduced in the long run. GHRP6 CJC1295 Ipamorelin Magnus Pharmaceuticals is supplied as a freeze-dried powder in the glass vial. This still does not have to be cooled. Add to your GHRP6 CJC1295 Ipamorelin Magnus Pharmaceuticals with 2mg active ingredient 2ml parenteral water in the vial. Now you have 2ml with 2,000mcg of active ingredient. 1ml with 1000mg of active substance = 0.1ml with 100mcg of active substance. The final peptide is injected with insulin injections. The now ready-to-use GHRP6 CJC1295 Ipamorelin Magnus Pharmaceuticals active ingredient (liquid) can now be stored in the refrigerator for weeks as described on the packaging. The use of GHRP6 CJC1295 Ipamorelin Magnus Pharmaceuticals is rarely associated with any side effects. There may be joint pain or slight numbness in the hands and feet. MAGNUS Pharmaceuticals is the top source for the purchase and purchase of peptides directly from the manufacturer. We hope you will find all the information about the subject GHRP6 CJC1295 Ipamorelin Magnus Pharmaceuticals, in Bodybuilding, Kraftsport. Ingestion, effect, side effects, dosage, mixing of peptides. Peptide cure, long-term application, the right application. To purchase and order the Peptide delivered.